Total number of deaths in Pakistan terrorist violence declined from 6,211 in 2012 to 5,279 in 2013, the lowest since 11,704 fatalities suffered in 2009, according to figures compiled by South Asia Terrorism Portal. While civilian casualties remained essentially flat--down only slightly from 3007 in 2012 to 3001 in 2013-most of the overall drop from 6,211 to 5,379 occurred in fatalities suffered by the security forces and the terrorists. Pakistan's biggest province Punjab with more than half the country's population remained relatively unscathed by terrorist violence with just 81 terror casualties in 2013. By contrast, FATA, Sindh, KP and Balochistan suffered disproportionately with 1,716, 1668, 936 and 960 terror-related deaths respectively. 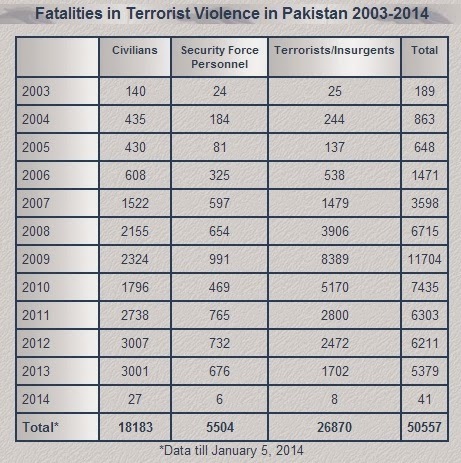 Sindh suffered the most civilian casualties in 2013 with 1285 dead in terrorist attacks. It is followed by 718 in Balochistan, 603 in KP, 319 in FATA and 64 civilian deaths in Punjab. Few terror-related deaths in Punjab, Pakistan's biggest province, appear to be the main reason why terrorism is not seen as a major problem by majority of Pakistanis in public opinion surveys. According to a survey conducted by the International Republican Institute (IRI), 42% respondents said electricity is the single most important issue facing Pakistan; while 21% said inflation, 12% said unemployment, 10% said terrorism and 3% each cited law and order, corruption and poverty as the most crucial issue. Only 1% considered gas/petrol shortage as the single most important issue of Pakistan. It seems that Pakistan's new prime minister Mr. Nawaz Sharif's agenda is set in response to the surveys like the IRI survey which are heavily influenced by the perceptions of his party's political base in Punjab. While the Sharif government is focusing on the energy and the economy, it is hard to de-link these priorities with action on terrorism. With Pakistan's domestic savings rate at an all-time low of just 4.3% of GDP, the country badly needs foreign direct investment in energy sector to revive the economy. Such foreign investment is unlikely to materialize in a big way without first tackling the scourge of terrorism in the country. What is urgently needed is a comprehensive strategy and a clear plan of action to fight terrorism in a coordinated fashion. The statistics are inaccurate. Shias' target-killed are not included in this even though there has been more terrorism against shias than any other singularity. Shams: "The statistics are inaccurate. Shias' target-killed are not included in this even though there has been more terrorism against shias than any other singularity." The contrast is not as exaggerated as it sounds. In recent years, Punjab has suffered less than the rest of the country from the suicide attacks and bomb blasts that have killed some 49,000 people since 2001. There have been dramatic exceptions: terrorist attacks against the visiting Sri Lankan cricket team and at a major Sufi shrine in Lahore, at army headquarters in Rawalpindi, and at a five-star hotel and courts in the capital, Islamabad. Anti-India militant groups like Lashkar-e-Taiba and anti-Shiite organizations like Lashkar-e-Jhangvi are based in Punjab and draw most of their recruits from the province. But these groups mostly stage their attacks elsewhere in Pakistan to maintain benign relations with the local authorities. And so the perception that Punjab has suffered less from violence than the rest of the country prevails, creating much resentment. For non-Punjabis, the province’s relative stability is just the latest demonstration of how Punjabi elites rally to protect their own interests at the expense of their compatriots. And such interprovincial rivalries could be as great a challenge for the country’s stability as the Taliban. It is commonly said that Punjab is synonymous with Pakistan, and vice versa, which seems to relegate the other provinces and autonomous regions to the status of outliers. Some of Punjab’s good fortune is an accident of geography: the name means “land of five rivers,” referring to the Indus River and the tributaries that flow through the province, making it the agricultural and industrial heartland of Pakistan. But politics matters even more. Pakistan’s elites, political, bureaucratic and military have long hailed from Punjab and shaped the country’s policies to the province’s advantage. Until recently, Punjab received the lion’s share of national revenues simply by virtue of having the largest population; never mind its actual needs or contributions to the national budget. (The formula was finally revised in 2009, benefiting Sindh, Baluchistan and Khyber Pakhtunkhwa provinces.) Also, the government and the military have long allotted prime agricultural land and urban real estate in other parts of Pakistan to Punjabi officers and senior bureaucrats. With nearly 23,000 intentional homicides in 2016, Mexico's murder tally was second only to war-torn Syria's 60,000, said Antonio Sampaio, one of the authors of the International Institute for Strategic Studies' "Armed Conflict Survey 2017.